Cullinan Guesthouse - Where memories are made! JanHarm Vorster welcomes you to the exceptional Gastehys JanHarmsgat, an affordable upmarket Bed & Breakfast (guest house) that is "Grênt with a difference". Gastehys JanHarmsgat is close to beautiful wetlands and next to ZAU Spa in the charming village of Cullinan, Gauteng. (For more info on our day spa specials click on the icon below). The Guesthouse is styled in conjunction with renowned local interior and lifestyle shop Rust in White. It has already been featured in Elle Decoration & Ideas Magazine & Via " 'n Ster vir my Bed. Not only will your charming hostess, Annah Msiza, make your stay as comfortable as possible, but guests have the option of four unique rooms, so you can choose the one that best fits your lifestyle. Each has a private terrace where you can enjoy a magical sunset with a complimentary sherry, or be greeted by sunrise with our complimentary tea, coffee and rusks. Piacere Pizza (book with Jan at 082 829 6797). Guests, both new and loyal regulars, are welcome to experience the White House! Bookings is essential, so please book online. Phone Celia on 074 3225 225 or email info@gastehys.co.za. If you truly want the Cullinan Experience, strolling down Oak Avenue and visiting the vintage shops, galleries, tour operators, jewelery shops and restaurants / tea gardens is a must. 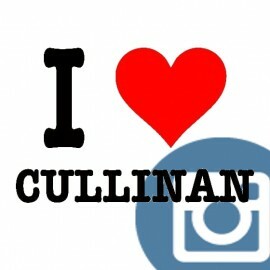 Please take pictures and share your photo's on all social media platforms #ilovecullinan. CULLINAN IS A SMALL TOWN 30 KM EAST OF PRETORIA, GAUTENG, SOUTH AFRICA. IT IS A SMALL TOWN ALONG THE DIAMOND ROUTE THAT IS HEAVILY RELIANT ON TOURISM AND THE MINE THAT DOMINATES THE SKYLINE. THE TOWN IS NAMED AFTER DIAMOND MAGNATE SIR THOMAS CULLINAN. THE ATTRACTIVE LITTLE VILLAGE OF CULLINAN WAS A PIONEERING MINING SETTLEMENT THAT MADE ITS NAME WITH THE DISCOVERY IN 1905 OF THE WORLD’S BIGGEST DIAMOND, THE 3 106-CARAT CULLINAN DIAMOND. THE VILLAGE IS PART OF THE DINOKENG INITIATIVE IN GAUTENG “AFRICA IN A DAY” AND SERVES AS THE GATEWAY TO THE DINOKENG AREA WHICH LIES TO THE NORTH OF IT. "Every visit to Cullinan brings so many surprising discoveries, beautiful friendships and magic memories that guests just cannot stay away for very long. It is hard not to share in JanHarm Vorster's passion for this picturesque village when he shows you why this historic town was one of the three Gauteng finalists of ‘Kwêla/Rapport Town of the year 2013’ competition." 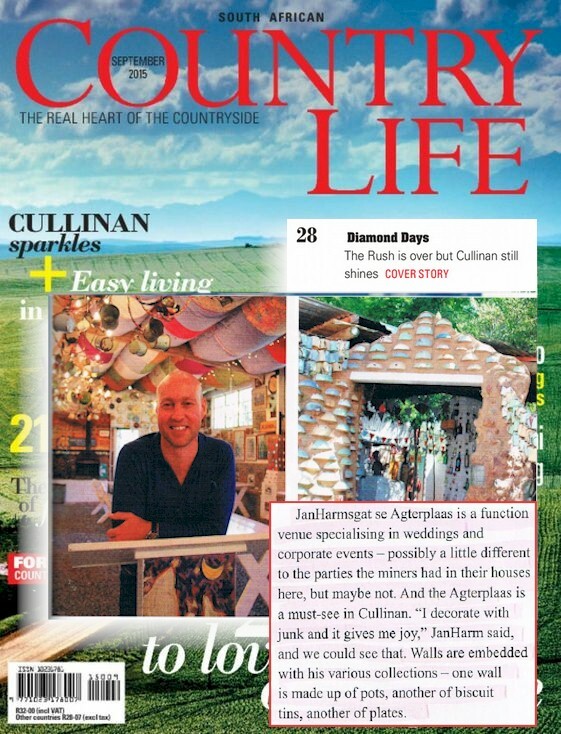 - Beren Bauermeister, Decor Editor SA Garden. "It’s a bit like falling down the Rabbit Hole; such is JanHarm Vorster’s ability to create fantasy with plants, space and food. Jan’s extraordinary garden and fairytale décor inspirations suffuse every detail of the four guestrooms, from the zany door in the roof of Leka Room’s bathroom, to the suspended chairs that double as bedside lamps in Fansy Suite, it’s all bewildering, but in the best way possible. Lush art punctuates the walls and I am thrilled to have a Walter Battiss silkscreen in my room. Bags deposited in my appointed ‘Leka’ room, it’s Beer O’Clock time." Every visit to Cullinan brings so many surprising discoveries, beautiful friendships and magic memories that guests just cannot stay away for very long. It is hard not to share in JanHarm Vorster's passion for this picturesque village! You must be thrilled with the end result - you have totally transformed the guesthouse into a brilliantly creative and wonderfully welcoming space. Of course it is completely wacky - but fabulously so!!! Love the bedside lights! 2014 - 2019 © Gastehys Janharmsgat, Guesthouse In Cullinan - Gauteng. All rights reserved.